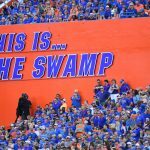 By finishing off the 2018 regular season with a 41-14 win over Florida State on Saturday afternoon, the No. 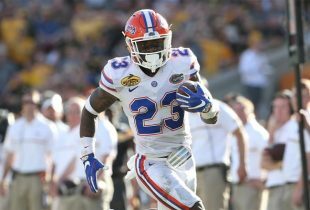 11 Florida Gators should rise when the new College Football Playoff Rankings are released on Tuesday night. Florida could be ranked as high as No. 8 at that time, but it is more likely to be No. 9, putting it firmly in the top 10 with no more games to play. 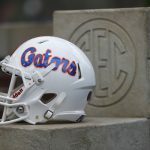 While the Gators would prefer to play in the SEC Championship Game, the benefit of sitting home next Saturday means it should wind up in the top 10 — but certainly the top 12 — by the time the final CFP Rankings are released in two Sundays. Why is that important? It puts Florida in position for a New Year’s Six bowl. The subset of the bowl system consists of the four playoff teams and eight additional selections. Automatically qualifying for those eight spots would be all Power Five conference champions and Notre Dame — if ranked in the top 12 and not in the playoff — along with the highest-ranked Group of Five team in the CFP Rankings (right now, that is UCF). Remaining spots are chosen as at-large bids by the committee, almost assuredly from the top 12 of its rankings. Because the ranked teams ahead of the Gators picked one another off, Florida winning out has allowed it to slide into a major bowl game one missing on missing the festivities completely. So where will UF play? The short answer: the Peach Bowl on Dec. 29 or the Fiesta Bowl on Jan. 1, 2019. The long answer: Well, it’s complicated. Because the Group of Five selection has played in the Peach Bowl for consecutive years, most analysts believe it will be headed to the Fiesta Bowl. That would put the higher-ranked of the two SEC at-large teams — assuming two are chosen — in the Peach Bowl with a non-SEC at-large team (as the bowl would likely not want a conference game, particularly a rematch). As it stands, LSU is ranked higher than Florida and would play in the Peach Bowl. And that may not change on Tuesday when the new CFP Rankings are revealed despite the LSU falling to Texas A&M, not being at 9-3 like Florida and the Gators holding the head-to-head tiebreaker over the Tigers. It remains to be seen what the CFP Selection Committee will do ranking these teams, but a seven-overtime road loss to a ranked opponent may not hurt LSU much at all. If things stay the same with LSU ahead of Florida, that would put the Gators in the Fiesta Bowl with the Knights, setting up a Sunshine State battle … in Arizona. Again, that’s if UCF wins its final game against Memphis without star quarterback McKenzie Milton. Ideal? Certainly not for fans that want to travel to a game nor those that want another high-profile Power Five opponent. But you can bet there would be a ton of hype for a Florida-UCF showdown and de facto state title game. No Florida finished 2nd in the east. Since Kentucky lost to Tennessee. It is always better to lose early in the season and finish the regular season on a winning streak to score the better bowl invitations. It’s about who you lose to – and when. UK owns the head-to-head over Florida, but they also fell with their losses more than UF did. It’s not the best system but it’s the one we have. Kentucky lost to Tennessee. Go sit down!